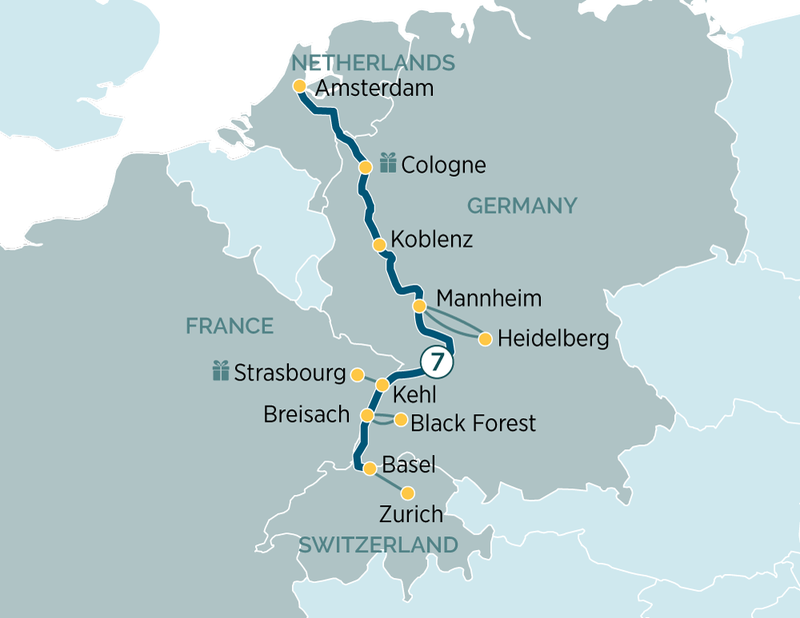 Continue upstream to the town of Mannheim, located at the confluence of the Rhine and Neckar rivers. There you will have a chance to either visit the medieval town of Heidelberg including the impressive castle which overlooks the town, or take part on an active hike to Heidelberg Hill. Once docked in Kehl you will be transferred by coach across the river to Strasbourg, the capital city of the Alsace Region in France. Your guided walking tour will include the Grande Île, the historical city centre and UNESCO World Heritage Site known for its medieval black and white timber framed buildings, old tanning houses, baroque sandstones buildings, canals and river locks. Strasbourg is home of one of the oldest Christmas markets in Europe, which you will have time to visit during your free time. Welcome to Switzerland and the Rhine–side town of Basel, the centre for Switzerland's pharmaceutical industry. After, your breakfast you will disembark your ship and transfer to Zurich Airport for your homebound flight.